It was a shining moment in Philippine history – the 1986 People Power Revolution, a bloodless coup that toppled the 20-year dictatorship of Ferdinand Marcos. I was five years old then, and knew little about the historic event that the whole world watched with wonder. The world admired the Filipino people, and in particular, a woman in yellow, a self-described plain housewife named Corazon "Cory" Aquino. She led the revolution, the culmination of a battle for freedom that was her husband's advocacy. It was a battle she won, and a victory that gave us back our nation's democracy. The events that transpired in the past five days are a testament to how much Filipinos appreciate what Cory has done for the country. Last Saturday, the former president of the Philippines, a worldwide democracy icon, succumbed to colon cancer. Since then, there has been an outpouring of love and gratitude from Filipinos. As word spread about her death, people went to her home to pray in silence for her; some left flowers, notes, and cards. The whole city of Manila, gripped with grief, was adorned with yellow ribbons and banners. And even before her remains arrived at the wake, people started lining up to pay their last respects. What happened next was nothing short of extraordinary. I was not present at the People Power Revolution, but the funeral procession last Monday – to transfer her remains to the Manila Cathedral – was, to Filipinos who lived through the Martial Law years, a reminder of 1986. "It is reminiscent of the past but in another way," said Nena Rosales, who was part of the People Power Revolution. "This is in honor of our ex-president, to show how much we love her for what she did for us in changing from the Marcos regime to a new democracy." Thousands of people lined the main thoroughfares of Manila; it was as if, for a few hours, the whole city was at a standstill. Amidst a shower of yellow confetti and a cheering crowd, President Aquino traversed EDSA and Ayala Avenue, where she first led the protests against Marcos. 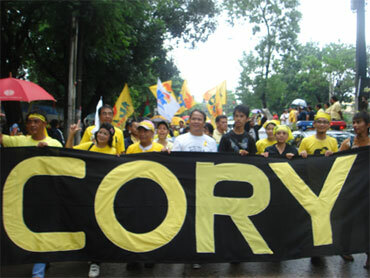 Friends and family of Cory marched with the people, and as much as they are grieving the loss of a loved one, Mikee Cojuangco, a niece, said seeing that the whole country was grieving with them gives them comfort. "When they offer their condolences, I can't help but offer it back to them because I'm not the only one who has lost an aunt, they have also," said Cojuangco. At today's funeral mass, Cory's youngest daughter, Kris Aquino-Yap, thanked the public for the overwhelming show of love and sympathy. "How can we thank you all for your effort to line up despite the heat of the sun and the heavy rains just to get a glimpse of our mommy, to pay your respects and to pray for her for the last time?" she said. Kris paid tribute to her mother, and in her parting words, she said, "I love you, Mom. I thank you for the privilege of being your child." "Goodbye Mom, thank you very much." And so as President Aquino's family bade her farewell, the whole country did. Heavy rains poured throughout the day in Manila, but again, thousands turned out. And this time, they did not just stand on the sides of the streets; they followed the funeral procession. Yellow shirts, banners, balloons, and confetti glistened like the sun under the gloomy gray skies. 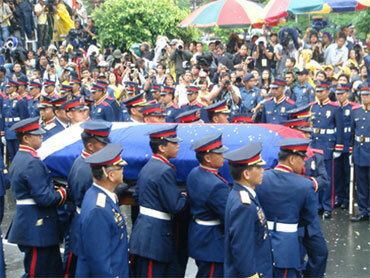 It took almost nine hours for the former president's funeral cortege to arrive at the Manila Memorial. It was met by military honor guards, and as befitting of a former president, she was given full military honors. Finally, she got her wish – she was laid to rest beside her husband, Sen. Benigno "Ninoy" Aquino, Jr. Some say the last time the country witnessed something like this was at his burial in 1983. Sen. Ninoy Aquino was a fierce political opponent of Marcos. He was incarcerated for seven years and seven months, and then granted exile to the United States. But after three years in Boston with his family, he decided to go back to the Philippines to help restore democracy. Upon arrival at the airport, he was assassinated. It was after this that Cory was thrust into the political limelight. She said so herself, she did not know anything about the presidency, but she accepted the challenge, unified the Filipino people, and gave us a newfound freedom. For most of my childhood, she was the president. I remember very vividly the sound of gun shots, the tanks that rolled in the streets, and the fighter jets that flew over our house. I remember the 12-hour brownouts everyday. And then there was the massacre in Mendiola, where police fired at protesting farmers. It was a tumultuous time. No, she was not the best president. But she inherited a deluge of problems, and for all its worth, I believe that she did the best she could. In the end, she will be remembered as the light in our darkest hour, the one who unified our country in life and in death, and the reason we are enjoying freedom. After all, I may not have been able to write this piece if not for Cory.